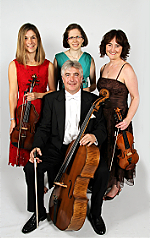 A carefully-selected cornucopia of works spanning nearly two centuries will be performed by this well-known local quartet, including music by Mozart, Borodin, Britten, Piazzolla and Bridge. This concert is generously supported by Margaret Goode and Bromsgrove Concerts. 'Horn Showcase' - The Birmingham Horn Sound - This talented group of eight horns visits for a second time, after pleasing the large audience in 2016. The emphasis this time will be to provide an enjoyable alternative to more serious classical music, with musical showmanship to the fore. 'Light Jazz Classics' - The Prewer Trio - Claire Prewer and son, Aaron, will be known to many from choral performances in the Orchestra of St John. In this concert, they present their talent in many well-known, easy-listening jazz favourites. lunchtime series from the Bromsgrove Institute Trust. To enquire about 'Music at Lunchtime' events, or for any other query, please email us.